Break out the flip flops, bathing suits, and umbrella drinks, the authors of Holidays with Jane: Christmas Cheer, Spring Fever, and Trick or Sweet are back to celebrate summer with six new modern Jane Austen adaptations. 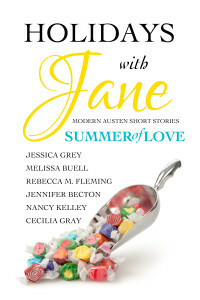 Slip Holidays with Jane: Summer of Love into your beach bag to add a little Austen to your vacation. For Anne Elliot breaking up with Finn Wentworth her freshman year of college was the hardest moment of her life. Now six years later and working as a media liaison for the Naval History office, she runs into Finn—an experienced marine archaeologist. Is this her second chance at winning Finn’s heart or will she be lost at sea? Two weeks in the Caribbean aboard The Castle of the Seas sounded like a dream to Cat Morland. But when her brother’s roommate turns overly possessive and her own best friend starts acting like a stranger, the dream is on the verge of being a nightmare. Can her new friends, Henry and Ella, redeem the trip for Cat? And is there any chance Henry could be more than a friend? Nora Dashwood’s plans for a relaxing summer fall apart when her sister Marianne arrives on her doorstep to get over a recent breakup. As if that weren’t enough, Nora must also deal with her delusional neighbor Lucy, a private investigator with an overeager client, and a handsome man with a secret past. Will Nora’s life ever return to normal, or will she have the romance she never dreamed of? 1. Camp Hartfield is THE only place to spend summer. 2. Ben Knightley will always be her BFF. 3. She has love all figured out…for everyone else. But when Emma’s attempt at creating fireworks for two fellow campers blows up in her face, she realizes she might not actually have love—or life—figured out. Fanny has been waiting the entire school year for her Eamon to come home from college for the summer so they can see if the sparks she felt the last time they were together are real. Only he doesn’t come home alone. Eamon brings new friends and he has new interests. And when his actions threaten her home and her future, Fanny has to wonder whether he’s really her Eamon after all. Liz Bennet has one rule when it comes to rich men: just say no. The summer she returns home to Meryton, Georgia, she begins to wonder if that’s a rule worth breaking. Her sister’s new boyfriend shows her rich men can be nice; but it’s Will Darcy, mastermind behind Pemberley Acres, who challenges everything she’s ever believed — and sets sparks flying. Eventually.